Outdoor Living > Plants & Lawn Care > Pots & Planters > Pots & Planters, Large, >19"
Add an enchanting look to your garden with the Dura-Trel Wishing Well. A hexagonal base on this item rests in your garden, supporting a dramatic peaked roof. This shape evokes the charm of classic cottage wells. A crank and rod rest under the roof for added realism, offering you a place to hang your favorite plant. Vertical slats form each base panel, bringing a wooden look to the item, and larger horizontal and vertical supports create a finished feel. Slightly pointed endcaps on each vertical leg add even more charm to the piece. 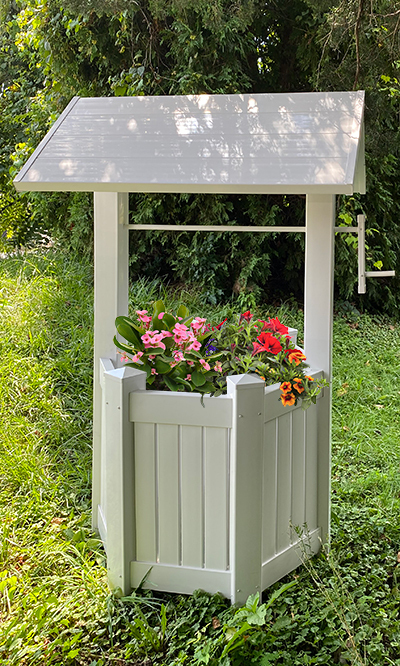 Place this unit on a flat surface in your garden for a striking look, or situate it over a stump or around a utility box to camouflage any unsightly parts. Use the open base to keep your garden hose or equipment hidden for more versatility. Place a preformed liner inside the well to house a fountain, or add a tall planter and watch plants grow up and over the sides of the item. The white color enhances the crisp lines on the item to capture the eye, and the vinyl construction adds sturdiness. This accent is constructed with the highest quality vinyl, containing the greatest concentration of titanium dioxide available. This compound acts as a powerful ultraviolet stabilizer, protecting the vinyl from the rays of the sun. This item will never fade, crack, peel, or rot, and its white color will remain vibrant for years to come. Create an exciting centerpiece in your garden with this Wishing Well. Assembly required. Made in the USA. Twenty year warranty.